Parishes throughout Australia are answering Pope Francis’ call to mark World Day of the Poor on Sunday by hosting community events to support those in need. Special lunches are planned in several capital cities and major centres throughout Australia, and smaller parishes are making donations to Church organisations dedicated to assisting the poor and marginalised. Pope Francis last year called on all Catholics to mark the World Day of the Poor on the 33rd Sunday in Ordinary Time each year. The Second World Day of the Poor will take place this Sunday, November 18. In Brisbane, a free community luncheon, offered and hosted by New Farm’s Holy Spirit Parish, will cater for about 50 companions of the local St Vincent de Paul conference. Fr Joseph Visentin CS said the luncheon would be for those people who had been offered a hand up and accompanied by the St Vincent de Paul conference. “Each companion will receive a personal invitation to attend,” he said. Fr Visentin said parishioners had responded generously to the initiative by making cash donations, and volunteering to prepare and serve food. “The response has been most generous. A small committee of members of the Pastoral Council and of the St Vincent de Paul Conference is now hard at work to organise the event in its details,” he said. Meanwhile in Sydney, Church volunteers are organising a meal for those in need in the forecourt of St Mary’s Cathedral on Friday, November 16. Fr Peter Smith, promoter of Justice and Peace for the Archdiocese of Sydney, said the Sydney Street Feast would promote a sense of inclusivity that recognised the value of all people. “With the help of sponsorship from PAYCE Foundation, St Merkorious Charity and Paynter Dixon, we will celebrate a meal from 12-midday until 2pm, serving the poor and marginalised of our city,” he said. Fr Smith said Sydney Archbishop Anthony Fisher OP would participate in the event that would include a substantial meal served by volunteers from a network of Catholic organisations, including entertainment from the Sydney Street Choir. “We hope to assist both the poor and well-off to recognise the face of Christ in all people and to see that it is incumbent on us not just to feed and clothe and house the poor, but to identify with them as our sisters and brothers. To share stories, to listen, and be attentive to the voice of Christ present in all – and to have some fun together along the way!” Fr Smith said. “Jesus said that as often as you do this to one of these the least of my brothers and sisters you do it for me (Matthew 25:40). If I truly believed that what I do for each person I encounter each day, and others did likewise, we may have a different world. “As Pope Francis titled this year’s message on the World Day of the Poor: “This poor man cried, and the Lord heard him”, I trust that in our small way we are demonstrating that we too are hearing their cry. 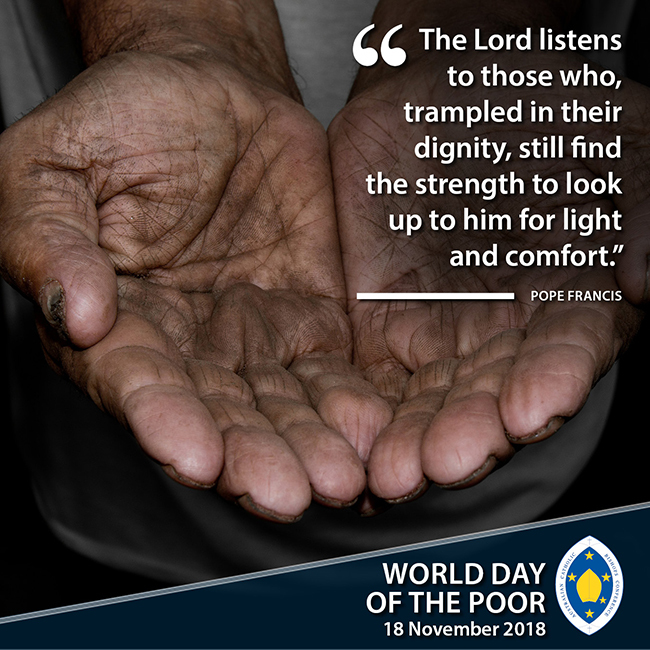 For more information about Pope Francis’ Second World Day of the Poor, go to: https://www.catholic.org.au/commissions/bishops-commission-for-pastoral-life. This entry was posted in Uncategorized on November 15, 2018 by ACBC Communications.